SMM parish welcomes all to go deeper into Scriptures and to be lead by the wisdom of God through the canon of the Church. Fr. 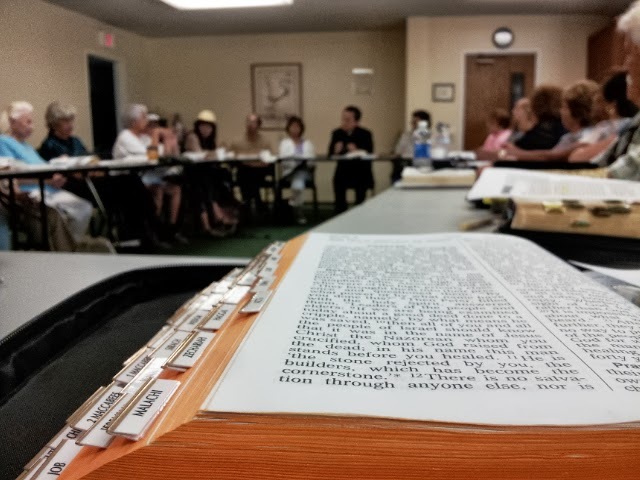 Bao leads a Bible study class every Tuesday morning from 9:00 am to 10:30 am. "For those whose duty it is to handle Catholic doctrine before the learned or the unlearned will nowhere find more ample matter or more abundant exhortation, whether on the subject of God, the supreme Good and the all-perfect Being, or of the works which display His Glory and His love. Nowhere is there anything more full or more express on the subject of the Saviour of the world than is to be found in the whole range of the Bible...."
"In its pages His Image stands out, living and breathing; diffusing everywhere around consolation in trouble, encouragement to virtue and attraction to the love of God. And as to the Church, her institutions, her nature, her office, and her gifts, we find in Holy Scripture so many references and so many ready and convincing arguments, that as St. Jerome again most truly says: "A man who is well grounded in the testimonies of the Scripture is the bulwark of the Church." (In Isaiam liv., 12.) And if we come to morality and discipline, an apostolic man finds in the sacred writings abundant and excellent assistance; most holy precepts, gentle and strong exhortation, splendid examples of every virtue, and finally the promise of eternal reward and the threat of eternal punishment, uttered in terms of solemn import, in God's name and in God's own words."